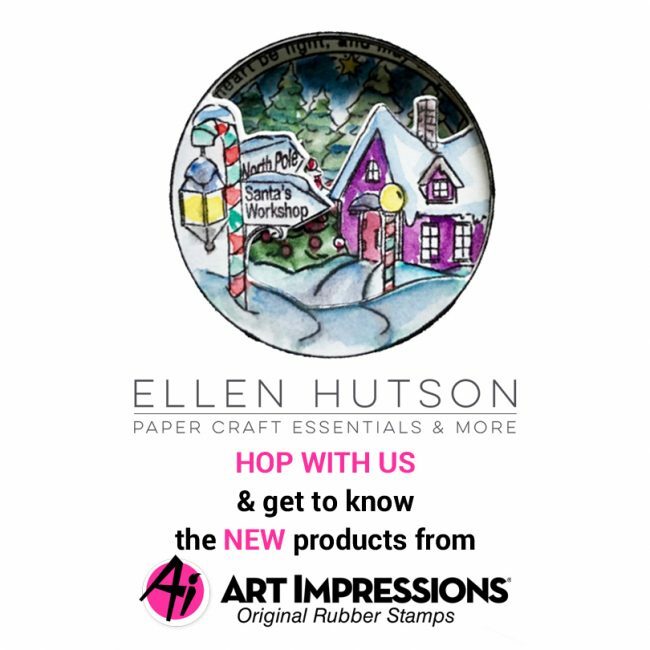 I was so excited looking through the new release stamps from Art Impressions that I made (gasp) 20 cards! 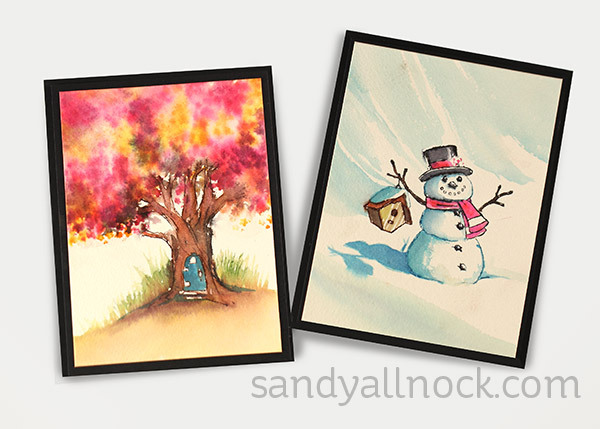 There are so many fun stamps for fall and winter, and some year-round themes too!! I can never do videos with them all, so I shared them with a few friends….so we’re doing our own little hop! Be sure to check out the list at the end of this post, but in the meantime – lemme show you some cards I made already! Watch the video below or click HERE to see it in HD on YouTube. See a thumbnail list of all the stamps at the end of this post! 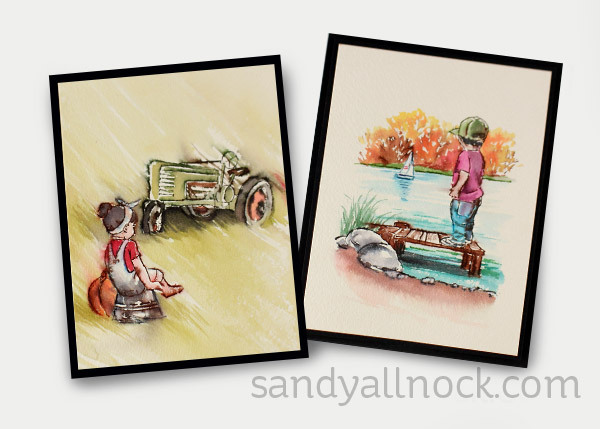 Watercolor kids – tractors and boats too! Some friends are joining in the fun with the new stamps – go see what they’ve all got in store! These are awesome. I think the pups and Santa,are my top picks. However,I like the church in different seasons. Oh and I just like it all who am I kidding trying to pick one. I love AI stamps!.. thanks for some great ideas Sandy!! Such a beautiful assortment of cards. Thank you for all the inspiration. I’ve really enjoyed seeing your new AI cards- cute, delightful & beautiful! Love the new release. YOU are the reason I’ve had to purchase their sets in the past & I love them. Thx for your wonderful inspiration! I love you teknig videos .The cards are beautiful and coloful. I love the cards. Great job! Sandy, do not know if you can help & pass this on but I don’t seem to be able to let Carly know how fabulous her work is on her blog for some reason & I don’t seem to be able to pickup Ellen’s site either. Could you pass it on it possible ? Swear my partner has rigged it so I can’t ship lol. 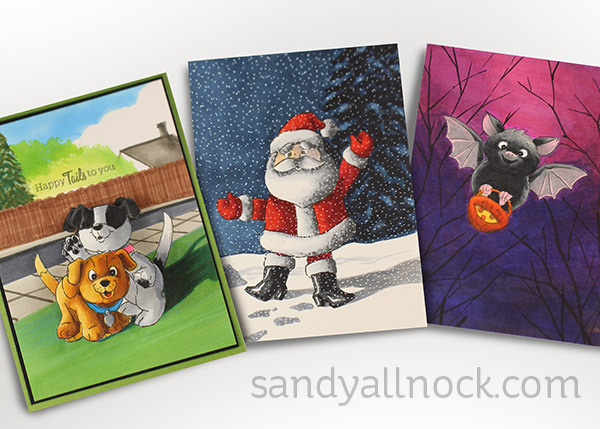 Sandy they are all so beautiful, I always like your cards & you have made real stunning cards with this realease, adore the super cute bat. I have tried to get some Ai stamps but they are few are far between over here so they sell superfast. Will get my hands on some soon as I’m dying to colour many of them. Each one out-does the other, Sandy! Beautiful cards! Ai is lucky to have you showcase their images…amazing! 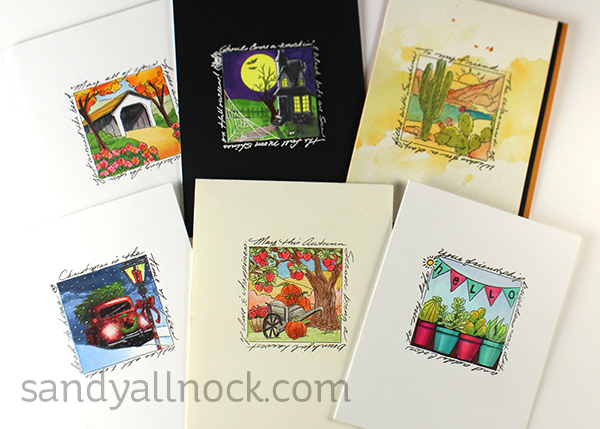 Such fun stamps and wonderful inspiration! Amazing details, and so lovely! 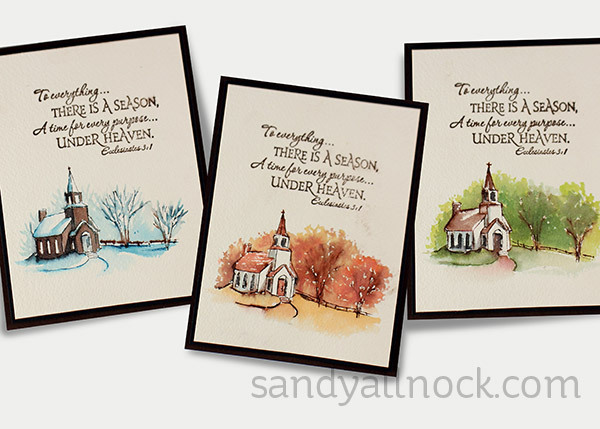 What is the name of the sentiment stamp used on the church cards depicting the seasons? 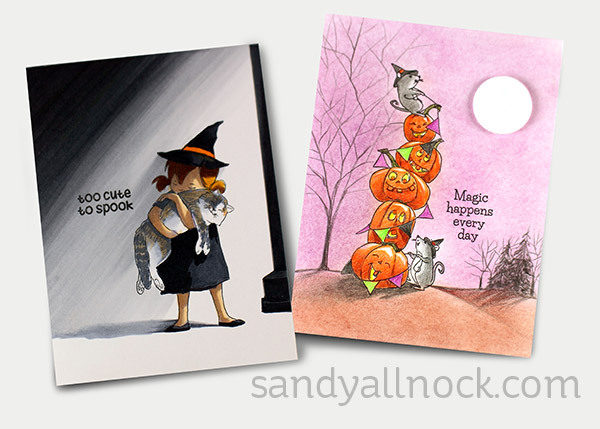 Unbelievable Sandy what a buch of great, awesome cards you made with this beautiful new release. Each and everyone is a little art work, thank you so much for sharing. 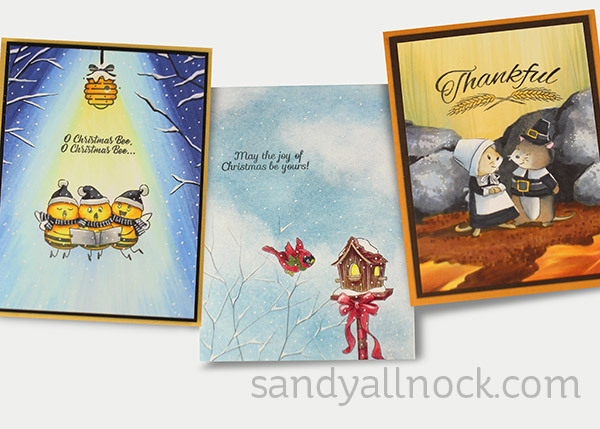 I love how you “see” the stamps, Sandy – gorgeous group of cards! Love the design of all your beautiful cards. Outstanding! I hope we’re gonna get to see videos of a lot of these being created. I could watch you color/paint all day. While watching your video, I teared up out of appreciate of your sharing your talents with me, and how you give information on how to make a card image look so much better. Shadowing/lighting DOES make a huge difference and it doesn’t take much more time including them. Thank you for all you do to help people throughout the globe. Oh! Almost forgot…. I like your new beginning and ending of your video… brings a smile to my face. So many fabulous cards!! I love the look of the brown ink stamped over the colored image. That little detail adds so much! Looking forward to any videos you may be sharing in the future. Oh wow, how I’m loving all of these cards made with AI stamps! They are all gorgeous and inspiring. I’m sending thanks to you and your friends for a lot of unique ideas. Absolutely love all of the Art Impression stamps. They are so creative and fun to make. You can individualize them for people and seasons.Thanks Sandy for sharing all your knowledge. I love the cards with the brown ink stamp over, it really adds something. Really beautiful cards. What a busy bee you have been! Ooo – sometimes no-line does not give the best results. Hmmmm. Must think about this! Thanks, Sandy! WOW! You’ve been busy, girl. What a wealth of great ideas to start from… I just wish I was this far along on my holiday card making. Thanks for the idea of over-stamping the AI watercolor images. That will make all the difference. I was having trouble with them being too “washed” looking… And the idea of stamping in blues for a snow scene – genius! Thanks again for ALL you do! I always love what you do with Art Impressions stamps because it’s always a way I would never think to color them. Thank you for the inspiration!